Better pull these ads quick. There's a minor update to them. Well, it’s official. Benoît Labonté is stepping aside as leader of Vision Montreal so that former PQ minister Louise Harel can run in his place for mayor of Montreal. I must say I’m surprised by this move. Not only does Labonté have a lot of ambition, but he’s made his campaign for mayor all about him. The Vision Montreal website still links to his blog, which has his face plastered all over it and is now useless as a campaign website (which makes his assertion that his cause “isn’t personal” absurd to the point of late-night comedy). They’ll replace it by one from Louise Harel (who will hopefully hire Labonté’s web designers instead of sticking with her current blog). I could criticize Harel on many points. She was the person who gave us the whole megacity disaster (fortunately for her, residents of Hampstead and Beaconsfield don’t vote for Montreal’s mayor), and she wants us to just forget all that, saying “there’s no question of rekindling the debate.” She’s an evil sovereignist who spent most of her political career in Quebec City and can barely string three words together in English. And she shares Labonté’s habit of using lots of words that say nothing, not to mention his lack of humility. But what gets me most is how matter-of-fact this all is. Five months before an election that Labonté has been preparing for more than a year, they have a meeting and just replace the leader. The ease by which this happened reflects something I wrote about with Labonté in April: He and his party have no platform. You can see it in Harel’s press release, just like in Vision Montreal’s “Manifesto”. There’s lots of talk of “true political and administrative leadership and attention to priorities,” but no discussion of what those priorities actually are. The only thing that ties Labonté, Harel and Vision Montreal together seems to be the only point of the platform so far: A dislike of Gérald Tremblay. Actually, to be fair, there’s one other platform point hidden among the empty calories of text about “visionary leadership” and “bold vision”: a desire for a radical change to the borough system and more centralized power at City Hall. It’s something Labonté has supported and something Harel instituted with municipal mergers (though her bill created the mess in the first place). But that still leaves a lot of blank that can be filled in by almost anything (provided it can be sold as bold and audacious) before November. They could fill it with Projet Montréal’s trams and greenery if they go through with a merger, as Harel hinted at. But I’d like to think that Richard Bergeron is smart enough not to tie his reputation to this sinking ship. 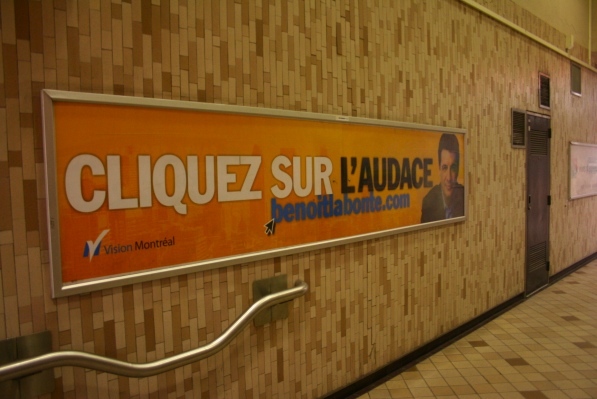 In the end, this probably says more about Vision Montreal and our city’s politics than it does any individual player. The parties can’t be pigeonholed like they can on the provincial and federal levels (Conservatives/ADQ xenophobic conservatives who want to dismantle the government piece by piece, NDP/Québec solidaire crazy leftists who want to pour even more tax money into inefficient black holes, BQ/PQ left-wing separatists who talk radical to get elected and then soften up when they get into power, Greens the environment nuts, and the Liberals the centre-left lesser of many evils who have the experience to run government and the experience to exploit their offices). We don’t really know what separates Union Montreal and Vision Montreal other than who’s leading them. Like with Labonté, I’m willing to give Harel the benefit of the doubt, and look forward to reading her platform if eventually it comes out. But right now it’s hard not to see the party of Pierre Bourque as a blank cheque to be cashed in by naive, ambitious politicians who want to parachute in and carpetbag their way into power based solely on their personal, vastly overestimated popularity combined with a lot of empty words from rejected Obama speechwriters. UPDATE: Le Devoir agrees with me, asking why the left-wing Harel is uniting with the pro-business Labonté. 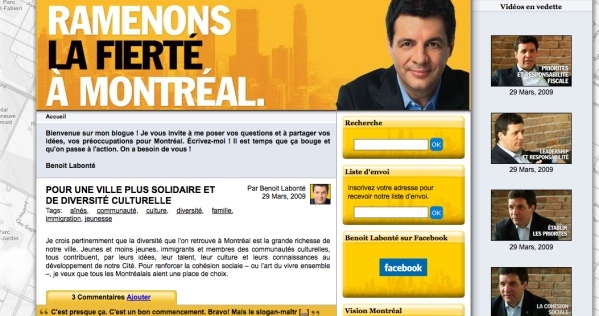 Even Richard Bergeron is outpolling him in the race for mayor of Montreal. So Benoît Labonté is running for the Vision Montreal leadership. Try to contain your shock. After leaving Gérald Tremblay’s Montreal Island Citizens’ Union party and being coy about whether he would join the opposition, then joining the opposition and being coy about whether he’d run for its leadership, he’s running for its leadership and I can only assume desperately searching for something else to be coy about. Considering even well-informed Montrealers would be hard-pressed to name a single other member of the Vision Montreal party (Pierre Bourque? No, he retired, remember? Yeah), the chances of Labonté facing real opposition is about on par with the Quebec government announcing fast-track funding for a West Island metro extension. Nevertheless, he’s putting quite a bit of effort into his campaign, because he’s really starting his run for mayor. I know I’ll be typing that one into my browser every morning. He introduced the Parco-don, a voluntary parking meter that accepts all those pennies we have no other use for, and distributes the money raised to homeless people (assuming, of course, that the loose change brought in is higher in value than the cost of emptying the machines regularly). He created places for kids to graffiti legally, thereby solving Montreal’s graffiti problem forever. He wants to make downtown streets, like Ste. Catherine Street in the Gay Village, pedestrian-only in the summer, an idea he and Tremblay are fighting over credit for. UPDATE: See Labonté’s way-too-long and way-too-political-cliché-filled manifesto.